When the Nepali cricket team won a game against Hong Kong by 5 wickets and was selected to play in the T20 World Cup, a lot of Nepali have rejoiced. Cricket fan Nepali actresses have expressed their joy and congratulated the players. Although there is a huge challenge for the Nepali cricket team in the World Cup, this types of successes are rare and are to be rejoiced. 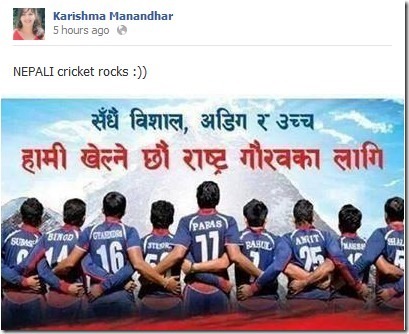 Actress Karishma Manandhar says, "Nepali cricket rocks." Actress Keki Adhikari expressed that she is very happy and is proud of Team Nepal. Nisha Adhikari says that she is happy beyond limits. Actress Benisha Hamal congratulate the Nepali cricket team for the win. Nepaliactress.com also congratulates the Nepali cricket team and wish they win the world cup! This entry was posted in Gossips and tagged Benisha Hamal, Karishma Manandhar, Keki Adhikari, Nisha Adhikari. Bookmark the permalink. ← Jiya KC to retire from doing hot roles ?